At its core TopPlace™ is a worldwide location rating system developed by AVUXI, which rates the popularity of every place on Earth. Popular means the most loved and relevant places, as agreed on by tens of thousands and sometimes even millions of people. To achieve worldwide coverage with accurate and categorized results, TopPlace™ algorithms analyze billions of user-generated geo-tagged signals, regularly indexed across 60+ public sources. To leverage the full power of TopPlace™ several Plug & Play products have been made available via the TopPlace™ platform. AVUXI’s TopPlace™ platform is mainly tailored for OTAs (Online Travel Agencies) and hotel Metasearch sites and consists of several products. TopPlace™ platform products help retain your visitors, increase conversions and increase the average booking value. What does TopPlace™ platform include? TopPlace™ Heat Maps. Instant overview of the most popular areas within a city displayed in easy to understand map overlays. Location Score Elements. 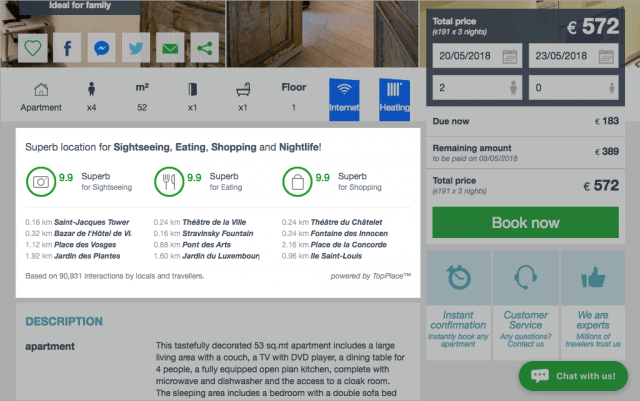 Location rating information for every hotel and apartment worldwide, rated by activity category (Eating, Shopping, Nightlife and Sightseeing) and nearby top venues & POIs . Points of Interest (POIs). Display the most popular POIs by category in any city on Earth. Social Neighbourhoods. A new way to understand the city. Shows city areas by type, not by name. Public Transport. Keep your visitors on your site. Easy visualisation of main public transport options. Display best areas in the chosen category, points of interest and public transport – over your map. Location Score Elements display proximity scores to the most popular city areas as well as nearby Points of Interest, according to traveler’s main activities: Sightseeing, Eating, Shopping and Nightlife. Advanced multi-scores are available for any location in any city, worldwide. Zero maintenance & updates costs – use the most recent location data available without spending resources to stay up-to-date – we’ve done it for you! Zero R&D costs – new products and features become available as we develop new products – you’ll always have the latest in location insights! Zero development costs – no need to have specialized developers & data scientists on your payroll working on location insights – it’s all ready! 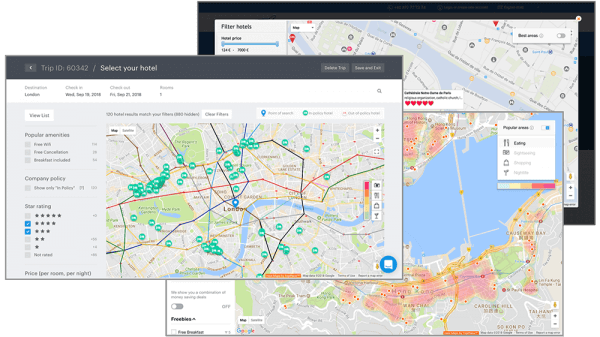 Zero infrastructure & traffic costs – our servers take care of the processing and serving of our Heat Maps tiles, location score elements etc – save on costs!